Remember that embarrassing incident when you dropped your cell phone in the toilet? Well, with these two new smart phones introduced by Sony today, instead of putting the phone in an uncooked bed of rice to dry it out afterwards… you can just rinse your dunked device off in the sink. The two phones, the Xperia advance, and the Xperia acro S, are both rated IP55 and IP57. That means they are supposed to withstand being submerged in water up to a depth of one meter (approximately 3.3 inches) for up to 30 minutes. It also means they are dust and rain/spray resistant. Buttressing up their tough phone credentials, Sony also said in today’s announcement that both phones are made with a scratch resistant glass and feature wet finger tracking. The Xperia advance (yes, Sony is going with the lower case letters in the name) has a 3.5 inch touchscreen. It’s powered by 1 Ghz dual core processor and comes loaded with Android 2.3. Sony says it will be upgradeable to Android 4.0, but they don’t say when. The phone also has a 5 megapixel camera. 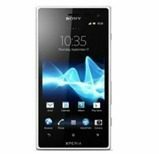 The Xperia acro S has a larger screen, 4.3 inches, and a faster processor, 1.5Ghz dual core. It comes loaded with Android 4.0, and has a 12 megapixel camera. The Xperia advance will be available in black, white or yellow. The Xperia acro S will be available in black, white or pink. Sony didn’t provide us with prices for either phone, nor a firm launch date, nor any details on what US carrier the phones will be on. They only said in their announcement that the phones will be released worldwide sometime in the 3rd quarter (late summer to early fall). We’ll keep an eye on this and let you know when more info becomes available.